Modern asymmetry. Natural. Burnished. A bootie so nice we created it twice! Functional, asymmetrical lacing makes the Corset fit like a glove with a chic and trendy look. Lace it right once, then the inside zip allows for easy in, easy out. It features Bionica’s unique freefit construction with ultralight foam padding, premium American hides, and a lightweight slip-resistant durable outsole. The Corset is the definition of comfort and fashion-forward – a guaranteed winner all day, every day. My feet are a little bit on the wide side but the laces allow this boot to adjust comfortably. I either wear a 7 or a 7 1/2 and the 7 1/2 fits perfect. I have this boot in purple and just bought it in black so that I can wear it even more often. It's so comfortable and easy to dress up or down. It breaks in quickly and looks awesome with almost anything. I love these boots and ended up ordering 6 different styles because they are so comfortable. They are so popular I had to look very hard for some of the boots that were sold out everywhere else. The width is little narrower than other brands, but I love them, they are supporting my arch. I read a lot of comments where everyone said to "size-up", so I did. They were at least a size too large. I wear between a 6.5 and 7. I planned on wearing thick socks, so I ordered an 8 . A 7 would have fit fine. But, I didn't like the way they looked or fit either, so I sent them back for a refund. Arrival of these boots were suppose to take 5-7 days, it was more like 14 days. I was so disappointed that these boots did not fit. Although I normally wear a 6, I took the advice of another reviewer who said to size up. I ordered a 7, which felt like a 5. I could barely get them on. They were also narrower than I expected. I sent them back yesterday. On the positive side, they are very nicely made and seemed that they would last several seasons of regular wear. I was very disappointed about this boots as this boots running in small sizes so its needed to warning your customers about that. So my size 9.5 was only 24.5cm so its much smaller than should be 9.5 size. 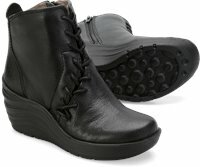 The Corset boot is the best wedge boot I've ever owned, and I've owned many. I was so happy with them that I purchased a second pair. The craftsmanship is beautiful and they are extremely comfortable to wear, even for someone who does a lot of walking in the city. The sizing runs small so you have to purchase an entire size up. I ignored this advice when I bought my first pair but Bionica kindly exchanged them to the size I needed for free.